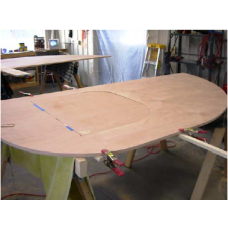 For those of you who do have the time, basic woodworking skills, and a garage or shop in which to build your very own teardrop camper, you’ll find that our Teardrop Plans are the most comprehensive available. There are a lot of plans for sale on the internet. Just look around. You will find reproduced sketches and blueprints of some of the originals, other modern designs, and a few step-by-step instruction manuals. For the most part, you will receive 9-35 pages of sometimes “suspect” information from someone who has never built a camper or if they have, maybe they have built one or two. And when you receive your plans from those sellers, you are on your own. Sink or swim. Wouldn’t it be nice to be able to SEE what your teardrop might look like when finished? Check out the others and you will find that “maybe” they have a picture or two. If you haven’t already done so, take a look at our photos on this web site and in our photo gallery. With our plans you can build any of these, and you can also modify any feature to suit your needs. Our business is building custom Teardrop Campers. Most of the others are in the business of selling plans--not just teardrops, but a myriad of other stuff. We know that for every custom teardrop that we build, hundreds of people are building their own. Our mission is to help, either by building a customer’s camper, or by helping them build their own. Over the years we’ve learned the “tricks of the trade” simply by building more and more campers. We share that information with you. Our manual is extensive; over 150 pages of detailed information, and over 200 drawings and pictures. We didn’t add “fluff” to our plans just to fill pages, but we have included EVERYTHING you need to know in a precise manner. When you use our plans, you are not alone. We offer FREE technical support along the way via email or telephone. You will have all of our email addresses, shop phone number, home phone number and cell phone numbers. Should you hit a snag along the way, it’s not just YOUR snag, but OUR snag. We’ll walk you through any process and if we have to, we will send you even more drawings or pictures to further clarify any questions that might arise. Start to finish, you will have our full attention. Our plans come with a template to cut your camper side walls and cabin doors. No math is involved! Also included are templates for single or double sinks in your galley! CD with printed templates: *$59 includes shipping and handling. PDF plans and printed templates: Downloadable pdf plans and printed templates. *$57 includes shipping and handling. 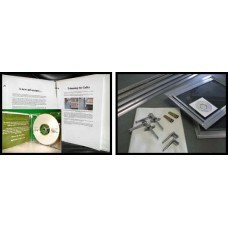 Printed plans with all templates and CD: Over 150 printed pages of text, drawings and photos in a three-ring binder. *$149 includes shipping and handling. 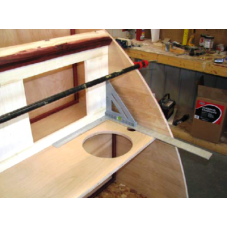 Big Woody Parts Kit at discounted price of *$399: Includes basic hardware and cd of plans. OVERSEAS CUSTOMERS: We charge $35 flat rate shipping on overseas orders for ALL our plans, as we still need to mail the templates. Please contact us before placing your order. Thank you! Includes: CD of Plans Side and back counter templates Two (2) 12" x 18" crank-out self awning screen/windows Two (2) Aluminum T Molding Two (2) 3/4" aluminum trims for door openings Two (2) complete door handle assemblies Two (2) Piano hinge for ..
Includes all templates, shipping and handling for US orders. We don't expect you to have a computer at your shop, but if you are reading this, you DO have access to a computer somewhere. You can load the CD and print the manual in its entirety or just a f..
Includes all templates, shipping and handling for US orders (template sent by mail). Downloadable pdf plans. *Flat rate of $35 for overseas shipping - please contact us before ordering!.. Over 150 printed pages of text, drawings and photos in a three-ring binder and CD - the most comprehensive in the business! Also included is a full size template for the sides and doors, and a template for single or double sink placement. Don't forget - F..